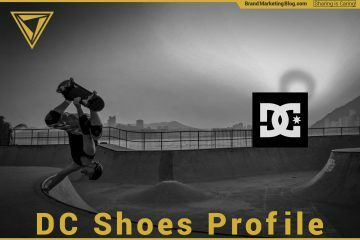 A reader requested that we profile Athleta as we have done for some other lifestyle brands like Beats by Dre, Arc’teryx, and DC Shoes. This was the first I’d heard of Athleta, but I enjoyed learning about them because their story and message of female empowerment were so compelling. Athleta is a brand of women’s activewear. They make clothing that women are comfortable to be active in through both the fit and style of the garments as well as their empowering message: “The Power of She.” Athleta was founded in 1998 in Petaluma, CA. The brand was purchased by Gap for $150 million in 2008. Their revenue is approximately $750 million. Nancy Green is the CEO. Women showing off Athleta swimwear. Athleta uses a wide variety of women to help model their clothing. This makes sure all women feel comfortable beting active, no matter their age, ethnicity, or body type. This post does a deep dive into Athleta’s history, marketing and brand promise to determine what lead them to become the household name it is now. Are Athleta and Lululemon the same? No, ‘Athleta’ and ‘Lululemon Athletica’ are quite different. While both are known for their activewear for women, Lululemon does not make clothing exclusively for women and Athleta does. Lululemon’s roots are in yoga, while Athleta’s are in running and cycling. Athleta enables women of all ages to participate in athletics with cuts, styles, and a message that supports them. Activewear companies have only recently started tailor to women. Classically, they have taken men’s apparel, shrunk it and maybe changed the color, a practice the clothing industry calls “shrink it and pink it.” Women who wanted to have an active lifestyle often felt constrained by the fit and style of garments from traditional activewear companies like Adidas and Nike. Women felt that the styles were masculine, and the cuts were uncomfortable and unflattering. Athleta, on the other hand, makes activewear that is developed for women by choosing cuts, patterns, and materials that women prefer. These properly design garments help women to comfortably participate in an active lifestyle making Athleta a lifestyle brand. Nancy Green, CEO of Athleta. Athleta’s brand promise is that clothing by Athleta will allow women to feel comfortable while active. The brand promise is reflected in their products, message and choice of models. Wearing their product is comfortable, and their message of “The Power of She” helps women to feel confident in their pursuit of athletics. Athleta began as a catalog brand that used models which were reflective of all ages, ethnicities, and body types. This inclusiveness helps to encourage a wide variety of women to get active: “We inspire her to keep living this full, healthy, active, rich life, no matter what her body type is, no matter her age,” says Nancy Green. Athleta is known for their workout tights and leggings that feature Sculptek fabric. There is also strong seasonal demand for their swimwear. Skirts, throws and sweaters feature Sueded Tactel, a proprietary quick-dry fabric that is soft. Founding principle: stop forcing ladies to wear dudes’ clothes. Vintage activewear. 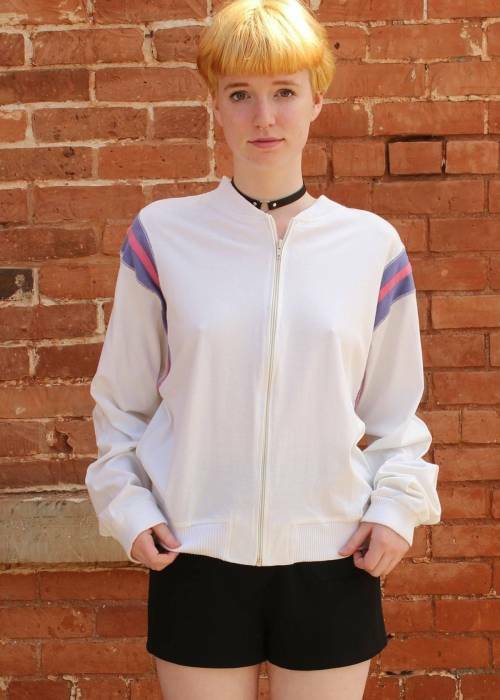 Activewear from the 1990s was made for men and adapted to women. “So, to participate in sports and training, I have to dress like a man?” Despite the use of women models, the choice of clothing reinforced the idea that athletics was a male endeavor and women were just visiting. The fashion industry also did not take the time to understand women’s fits and tastes; ‘shrink it and pink’ it was a common phrase. Scott Kerslake, a cyclist, surfer, and former investment banker, observed the discrepancy between the active wear industry and women. He cycled with women who had to put up with substandard gear; the clothing bunched and cut into their bodies while cycling, and the styles and patterns did not reflect the women’s tastes. Making the entire experience uncomfortable. Scott’s observations of the women he cycled with sparked his idea to create a woman-focused catalog clothing business so they could work out and participate in sports clothes that were both comfortable in fit and the style. Women’s empowerment? A tough sell in the 20th century. Scott Kerslake found it challenging to raise the capital he needed to start Athleta. Men in finance didn’t understand the needs of women and vision of Kerslake. But, with grit and belief in his vision Kerslake eventually raised $700,000 in seed capital. A team aligned on the mission of supporting women. 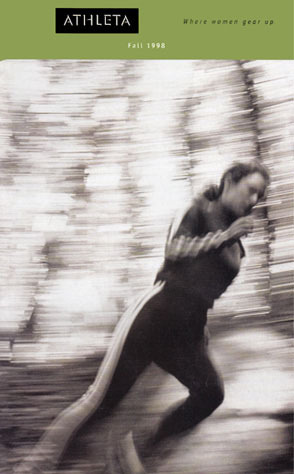 The cover of the 1998 Athleta catalog. Even in Athleta’s early days, they were providing imagery to help encourage women to participate in an active lifestyle. Taking the $700,000 raised in seed capital, the company was founded in 1998 in Petaluma, California comprised of a mostly female team of cyclists, runners, yogis, rowers, etc. Athleta needed to have a healthy company culture if it were to improve the health of the broader culture: They wanted to improve the physical health of women, and an overall healthier view of female athletes. Creating a brand plan. Like all of the lifestyle brands we have covered, the desire to participate in a lifestyle was already there, so the brand was not about drumming up demand with a cool and stylish marque. Women wanted to participate in athletics, so Athleta just needed to remove barriers to that lifestyle. If you are curious how to develop a lifestyle brand strategy like Kerslake did for Atheta, read our article on how to identify a lifestyle and develop a brand promise to help enable it. Now, you can find 100+ brands by opening the Instagram app whose core value is empowering women, but a company like Athleta was novel in the late 90s. Many people view Athleta as a Lululemon Athletica knockoff, but Chip Wilson started Lulu while Scott was starting Athleta with one not being aware of the other While they serve the same market now, Lululemon approached the market through yoga and Athleta through running and cycling. Scott took his time planning out the brand and the brand strategy. Athleta aggressively grew in the early days. They sold $18 million worth of clothes in 2001 and $30 million in 2003 according to analyst approximations. Scott Kerslake has since developed a track record of achieving high growth rates in apparel companies. Athleta had a period between 2004 and 2007 where is stagnated. 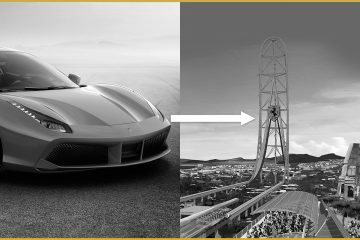 Revenue only grew $7 million over 3 years, a far cry from the doubling of income it did in the early days.The initial shareholders eventually sold it with Blue Highway holdings. They moved their distribution center to Grove City, Ohio so that they could cut expenses by being closer to the majority of their purchasers. The company grew the number of people receiving catalogs from 13 million in 2007 to 21 million in 2008. 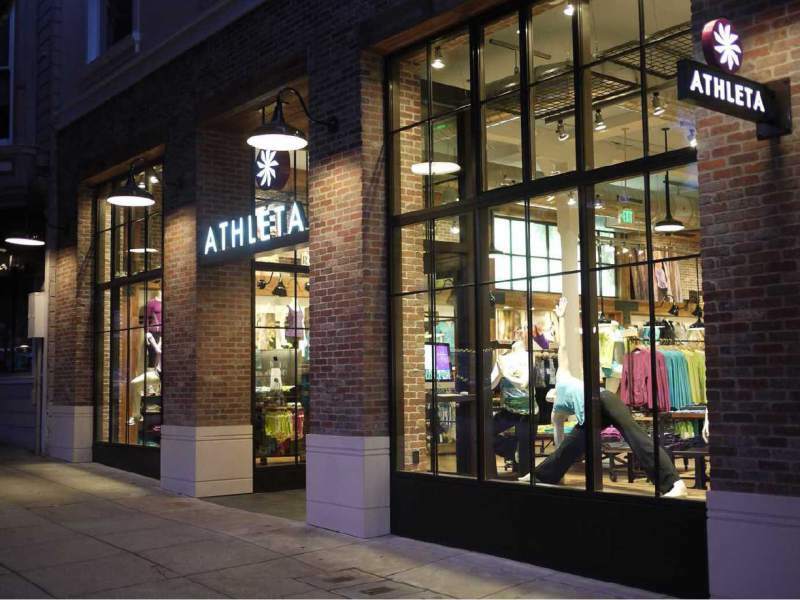 Both advancements made Athleta more desirable for acquisition. Gap Inc. purchases Athleta for $150 million. In 2008, Blue Highways Holdings sold Athleta to Gap Inc. for $150 million. At the time, Athleta was selling approximately $40 million in clothes with a staff team of 250 employees.Athleta has been a good investment for Gap as Athleta has maintained its strong brand where Gap’s other assets have faltered. The Athleta store in San Francisco. Utilizing the knowledge and talent of Gap Inc., Athleta achieved great success and grew their revenue by aggressively opening retail locations. Back to high growth, and high impact. After their acquisition by Gap, Athleta started to grow in both revenue and brand awareness Gap applied its knowledge of retail and extended the Athleta’s line of products into new types of clothing. Nancy Green came in as CEO in 2013 and put her foot on the gas. 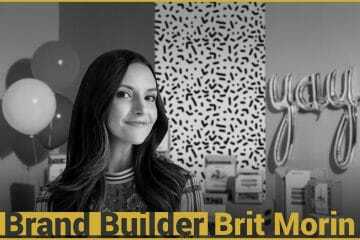 The company has grown 25% year over year under her leadership, and she has invigorated the brand with new meaning by initiating the “Power of She” campaign. “The Power of She” campaign started in 2016 which built on both Athleta’s value and history of supporting women. This new message of “The Power of She” highlighted that any woman of any age had the power to do what they wanted, and this resonated with a culture in desperate need of that message. The campaign was running as women watched Donald Trump take on Hillary Clinton on CNN and the #MeToo updates on E! Nancy Green and Athleta enjoy the full confidence of Gap Inc.
Art Peck, Gap’s chief executive officer in 2017. Athleta has continued to grow while Banana Republic and Gap stores have struggled. 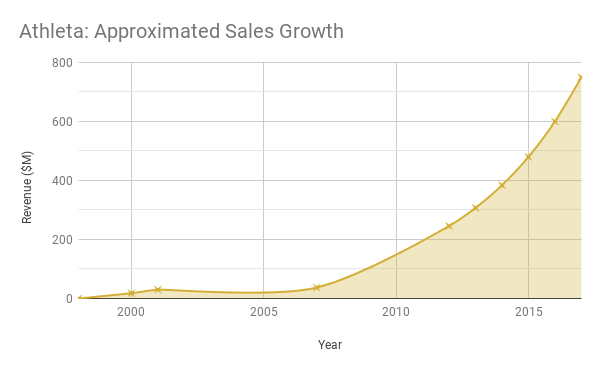 Athleta approximated sales growth. Athleta started out growing quickly, stagnated for a period, and then started growing again after the Gap Inc. acquisition. As Athleta celebrates its 20th anniversary, the company looks to the future. The sales environment for garments is changing more quickly than ever. Hill City, an activewear brand concentrating on men, was announced by Gap this September with Noah Palmer at the helm. The company is entirely separate from Athleta but is an odd mirror image. Main threat to Athleta: the influencer model of apparel. The market for apparel is changing more rapidly than ever. Influencers and their personal brands have far more power now than when Athleta started. Athleta succeeded by creating a personal connection with its diverse models and patterns; now, women get that personal connection by feeling part of influencers’ lives through Instagram and other social media. 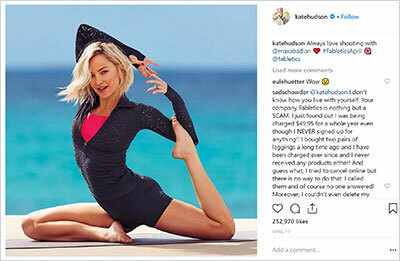 Kate Hudson posting on Instagram about Fabletics. The apparel market has turned to influencers. People believe they know celebrities and bloggers through social media and trust their recommendations like a friend’s. Celebrities like Kate Hudson, Carrie Underwood, and Gwyneth Paltrow have started lifestyle brands of their own with great success. Athleta pursues a grassroots strategy that is in keeping with their roots as a movement. They have a brand ambassador program with advocates all over the country. They run an affiliate program which incentivizes fashion and active lifestyle vloggers to talk about their merchandise. However, if celebrity and top influencers continue to see success with their lines of private label and co-branded products, then Athleta might regret their grassroots strategy. Possible weakness of Athleta? Brand dilution. Athleta denim. Does it make sense for a brand known for activewear to be making jeans? Since the Gap acquisition, Athleta has had brand extensions that have pushed them into categories and business activities unfathomable to the founding team. Time and again we observe large public companies that purchase smaller brands that have meaning to people and pressure these smaller brands to expand their offerings rather than doubling down on the products that not only created their meaning in the first place, but created their success(es). We see the effects of this pressure to expand the lines when design errors get produced at scale. Athleta was forced to stop selling a pair of yoga pants that had a nearly identical pattern and coloring to the product offered by K-Deer, a smaller New Jersey company. I don’t see this as nefarious; from my experience, I suspect the design team was pressured to make design after design to expand the line to its absolute extent, and cut corners and accidentally copied a design they had seen. Another lifestyle brand enabling people to participate in the active lifestyle they want, and was purchased by a big company. Athleta is now even making jeans, applying their Sculptec fabric to denim. Jeans are the furthest thing from active wear, and the basic blue of denim are a far cry from the fun patterns that gave Athleta their early success. When you push the limit of what the brand means, it doesn’t break in spectacular fashion, rather, the brand dilution creeps in and the the brand equity slowly dissolves. Dilution is the brand killer. I worry that no one will know what it means to be a part of the Athleta brand if their aggressive line extensions continue.